I would like to thank Holiday Inn for partnering with me to make this post and my previous post My Weekend Review: The Holiday Inn at Baltimore BWI Airport possible. Have you ever learned of a location that left you with an extreme desire to go? For me, that was the Antietam National Battlefield. Not only did I have to get there someday, I needed to get there for a specific day. That one special day, everything in me insisted on experiencing, was The Antietam National Battlefield Memorial Illumination. I am willing to bet many of my readers will be left wondering the same things I did when I first heard of this location and event… What is Antietam all about? And what is an Illumination Memorial? It is amazing how much we don’t know about our own history. While I am sure every American has heard of the Civil War, I think Gettysburg will be the one and only battle they are familiar with. Although Gettysburg is definitely one of many battles that shouldn’t be forgotten, the devastation at Antietam is one most Americans have never heard of… Unless, of course, you live local to the battlefield or you’re a Civil War buff. On September 17, 1862, about 100,000 soldiers engaged in battle in the small town of Sharpsburg, Maryland. Antietam, referred to as Sharpsburg by Southerners, was a 12-hour battle that left a total of 23,000 men dead, wounded or missing. Known as “The Bloodiest One Day Battle in American History”, it was a narrow victory for the Union Army. At the cost of 23,000 men dead, wounded or missing, what did the Union gain? There were a few things the Union gained from the victory at Antietam. Due to other losses, the Union’s morale among soldiers and citizens was shaken. The North needed a victory more than ever in hopes of turning things around. The win at Antietam not only give the North a badly needed morale boost, it put a stop to the Confederate Army of Northern Virginia’s first invasion into Union territory. It also enabled Lincoln to release The Emancipation Proclamation. With its release, the North not only fought to preserve the Union, it looked to bring an end to slavery. Finally, the victory squashed all threat of British intervention on the side of the Confederacy. What is the Illumination Memorial all about? The Antietam National Battlefield Memorial Illumination is an annual event that honors the memory of each soldier who was killed, wounded or went missing during the Battle of Antietam. 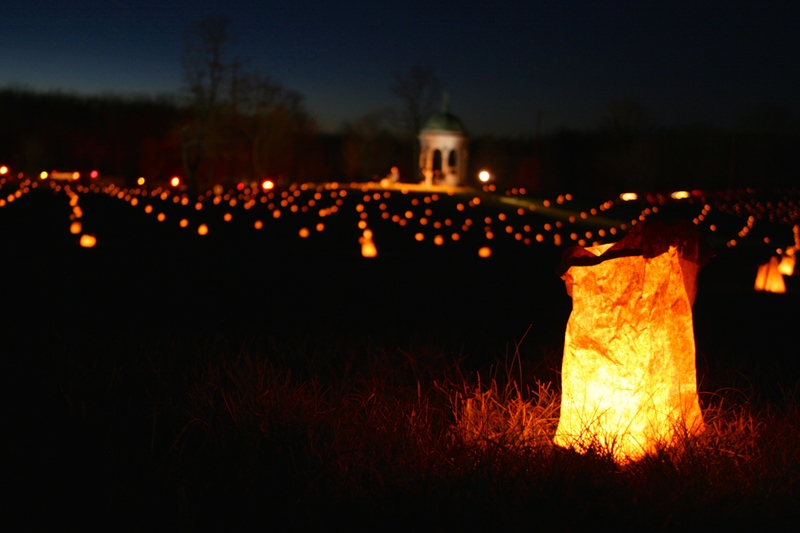 On December 5, 2015, I was fortunate enough to experience their 27th Memorial Illumination, which was hosted by the Antietam National Battlefield, the American Business Women’s Association and the Washington County Convention and Visitors’ Bureau. In memory of each solider, a candle is carefully placed on the battlefield… 23,000 candles in total, lined a five-mile route that was included in a driving tour. During this driving tour, visitors are instructed to only use their parking lights and are expected to drive through without stopping or getting out of their vehicles. Due to the popularity of the Antietam National Battlefield Memorial Illumination… lines to get into the event can be a two-hour wait. I promise you; it is well worth it. Starting my day at Visitor’s Center, I had a chat with the staff before grabbing some pamphlets and a self-guided Battlefield tour. Jumping back into my rental, I started to make my way around Antietam’s 11 points of interest. However, before I could even focus on Antietam’s history something else caught my eye. The first thing I noticed, which was hard to miss, were the volunteers. I had gotten to the battlefield around 10am but you could tell they had started their day hours earlier. Young and old… Boy Scouts, Girl Scouts, veterans, local organizations and residents. Working in large groups, they carefully placed each luminary. Using rope, they worked tirelessly to be sure each was placed with the others in straight lines. Watching the process and the number of people involved was pretty impressive. While there are several points of interest at Antietam, I have decided to highlight the ones that affected me the most during my visit since It would be impossible to cover each location and monument properly in this short article. Built in 1852, this little church became the center of several attacks made by the Union Army against the Confederates. As if a battle breaking out around a church wasn’t odd enough… the use for it following the battle would put a chill up most spines. Like most homes and buildings at the time, the church was used as a makeshift hospital looking after some of the 17,000 wounded soldiers. Some even believe the church was used as an embalming station by the Union Army following the battle of Antietam. The three-hour battle, which took place on The Sunken Road is an unimaginable one. In that short period of time, 5,500 men were killed or wounded… earning the otherwise quaint, country road the name, Bloody Lane. It was on this 1.5-mile trail that 2,200 Confederates did all they could to hold off 10,000 Union soldiers. For a place that would otherwise be viewed as peaceful countryside… this location was once someone’s worst nightmare and final resting spot. As I stood where 5,500 men once fell… I couldn’t help but get upset. Antietam National Cemetery was created to solve problems the large number of dead created for the living. Originally, soldiers were buried where they fell in shallow graves. Before long, the bodies started resurfacing. Besides the fact this would be a horrific sight… this problem would lead to disease and death for those living in Sharpsburg. In order to solve the problem, money was raised to build a cemetery to bury the dead. At first, the plan was to bury both Union and Confederate soldiers in the new cemetery… However, tensions between the North and South were still too fresh. To deal with the problem, Confederates were moved to three local cemeteries while 4,776 Union soldiers were moved to the newly created, Antietam National Cemetery. Before it became a cemetery, this plot of land was used by Confederate artillery. Today, you can visit and pay respects to the Union soldiers who were buried here, as well as dead from four other wars. Second, For every stone that bared the name of the dead… there were several markers that just displayed a number. The number of bodies that weren’t identified are heart breaking. Imagine how many families saw their loved ones off… only to hear nothing in the end. I’m sure in their hearts they knew their loved one’s fate… but not knowing the how, when or where they were laid to rest must have been hard to deal with. Finally, the statue of a Union private, which stood in the middle of the cemetery, was hard to miss. Encircling this statue were lines to a poem, followed by headstones… his comrades, that all seemed to be standing at attention. Headed back to the Visitor’s Center with a new appreciation of Antietam, I was lucky enough to attend the Illumination Ceremony. During the Illumination Ceremony, many people involved in the memorial including organizers, volunteers and state representatives spoke on the importance of the Memorial Illumination and what it has meant to them personally. There was prayer and song for those who died during battle. At one point TAPS could be heard from Dunker Church followed by Amazing Grace on bagpipes from the Visitor’s Center. It was during this ceremony that I learned the Antietam National Battlefield Illumination was in its 27th year… and that 1,500 people volunteer annually to help setup the candles. The fact that that many still people care today, about an event that happened so long ago, left me speechless. There were several points during the ceremony that touched me, but the moment that stuck with me most of all came when a musician approached the microphone. Taking to his guitar he began to play as he sang the words to Hallelujah. His voice and the words to the song eerily drifted over the battlefield and with it my heart sank. The reality of my trip, of the whole experience had finally hit. With a fresh pair of eyes and a sun that was quickly setting, I stood surrounded by thousands of flickering little bags of light. These flickering little bags of light stood in formation, stretching for as far as I could see in all directions. 23,000… each representing a husband, father, brother, son, uncle and friend who had died, had been wounded or had gone missing where I stood in a 12-hour battle. I stood imagining the shadows of these men standing beside me. I imagined the sounds and smell of the gun and cannon fire. I imagined the chaos, horror and fear that would come with battle. I imagined the dead, the dying and the wounded crying out for help. To say I was overwhelmed with emotion would be an understatement. I wondered if it were strange to be so emotional over an event that took place long before I was born? As the ceremony came to an end and the crowd began to disperse, I found myself left behind in the silence with a handful of others who had permits to photograph the memorial. As I sat, surrounded by candlelight, I realized two things. One was that numbers are cold and are incapable of telling the full story. Simply hearing or reading the number 23,000 does not make the same impression as seeing that number physically represented. I found the candles made it easier to grasp just how devastating Antietam was. The second thing I realized, no distinction was made when it came to who was Confederate and who was Union. No one cared. The purpose of the memorial wasn’t to remember one side or the other. Who won or who lost. The point was… They were all American. The Civil War wasn’t some far off battle fought between two foreign lands. It was fought in our own backyards and pitted our ancestors against each other. It tore families apart, leaving in its wake hundreds of thousands of dead and left a generation of Americans in shambles. At a time when our country couldn’t be more divided, there are many lessons to be learned at Antietam that couldn’t be more important. I would encourage everyone reading this article to visit. The Antietam National Battlefield Memorial Illumination is an experience I will never forget. I will be forever grateful to the Holiday Inn for helping me check this must see destination off my list… and I look forward to returning one day. Thank you for your observations concerning the Battle of Sharpsburg. I had the opportunity to visit a few years ago. It is by far my favorite battlefield of the War to Prevent Southern Independence. We followed the path of General A.P. Hill from Boliver Heights at Harper’s Ferry, across Bottlier’s Ford, to the back of the battlefield. I had the same feeling as you when walking through Bloody Lane. Realizing what happened there gives one a sickening feeling and I left part of myself behind. The battlefield does not have the carnival atmosphere of Gettysburg and is in pristine condition. I would recommend anyone who is interested in Gettysburg to tour Sharpsburg also. I loved Gettysburg but I totally agree-Antietam/Sharpsburg isn’t so showy or dressed up. It feels as though you’re walking onto the land the way it was left following the battle. The other thing… I like that its not swamped with ghost stories/tours/etc. I get so tired of that with historic locations-why cant the facts and history be enough of a draw? In Gettysburg’s case-I feel the ghosts stories do turn it into a bit of a carnival which is a bit of a turn off for the history lover in me. It’s just sad, I guess. Sharpsburg is definitely one to experience-especially the Illumination Memorial. The photographs are really beautiful and well done. Did you take them? I did take them, thank you! 🙂 I really enjoyed my time there-amazing event to witness. 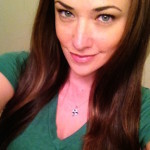 I really admire your work and your dedication to your passions on History and Art, You are a special type of person. This ole world needs more people like you. Very nice insight on what must have been a beautiful memorial. Thank you. When I go there are you going to give me a VIP treatment and show me around 😉!! !